We won't ask why you want to automatically convert your emails to PDF. You have your reasons, and we respect that. Our job is to provide you with a tool that will accomplish this task, and free you from the tedium of doing it manually. 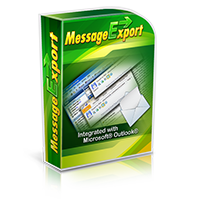 MessageExport is an Outlook add-in developed by us, Encryptomatic LLC. It is a tremendously flexible tool for converting and copying Outlook emails. One of its strongest capabilities is email-to-PDF conversion. 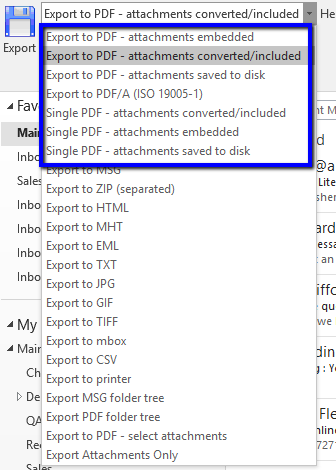 MessageExport add-in lets you automate Outlook email conversion to many different formats, including PDF. It is compatible with Microsoft Outlook 2016/13/10/07. 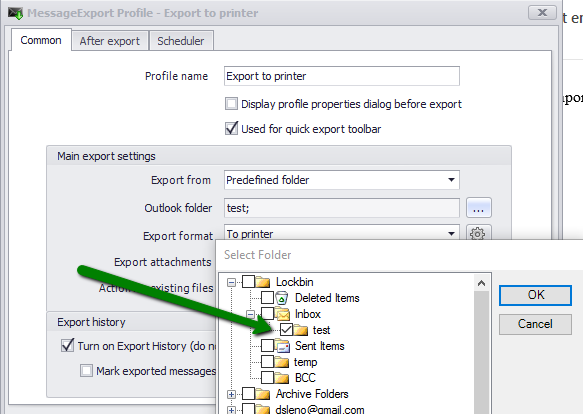 In this article will show how to create a custom export profile will look at an Outlook email folder, and then convert any new emails that it finds into PDF files. This article uses MessageExport version 4, and Outlook 2016. The first step is to get a free trial of MessageExport add-in from the MessageExport product website. After installing MessageExport, locate the toolbar in the Outlook tab called "MessageExport." In the drop down list, choose the export profile named, select one of the options to "Export to PDF." 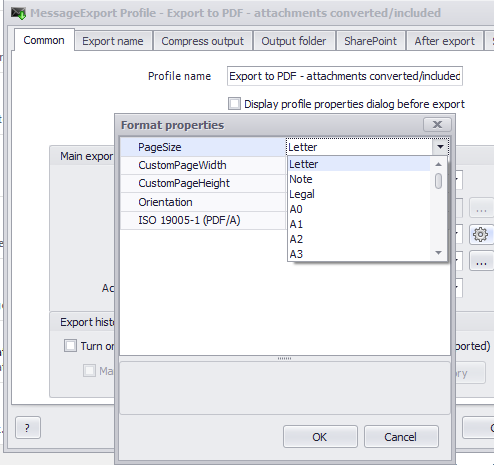 MessageExport provides several different methods for Outlook email-to-pdf conversion. I will use "attachments converted/included." 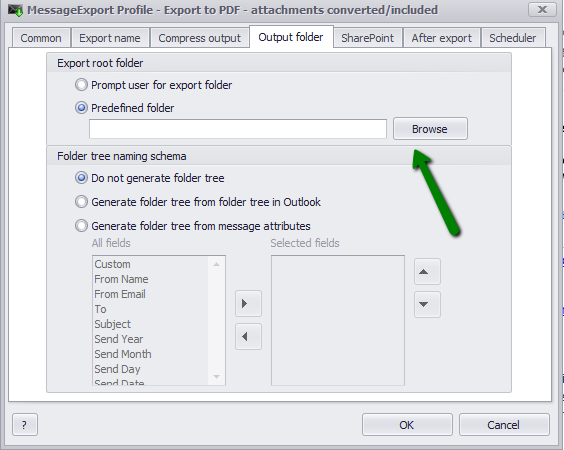 This option will attempt to convert both the email and file attachments into the PDF image. Now click or tap the Tools icon to edit the selected export profile. In the Main Export Settings, change "Export format" is set to PDF. Then, click the gear icon to make any necessary adjustments to the PDF formatting. For example, you may want to set the PDF page size to Legal. Choose the page size for the PDF file. 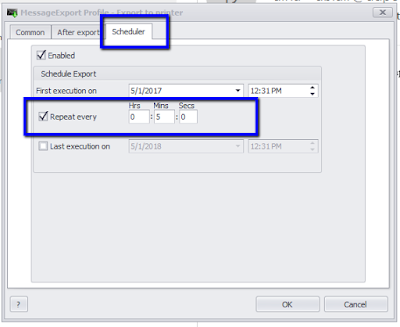 Next, change the"Export From" field to "Predefined Folder." This will bring up a new window called "Select Folder." Place a check mark in one or more Outlook folders from which MessageExport should create PDF files from newly received email messages. You can select the top folder, and it will search all Outlook folders for new emails. Or, you can select a single folder. It will also search subfolders for new emails. Finally, we don't want MessageExport to create duplicate PDF files from your emails. To prevent this, place a check mark in "Turn on Export History." MessageExport will now track which emails it has already exported to PDF. Next lets tell MessageExport where to save the PDF files. Click or tap the tab labeled "Output folder." Browse to the folder on your disk. 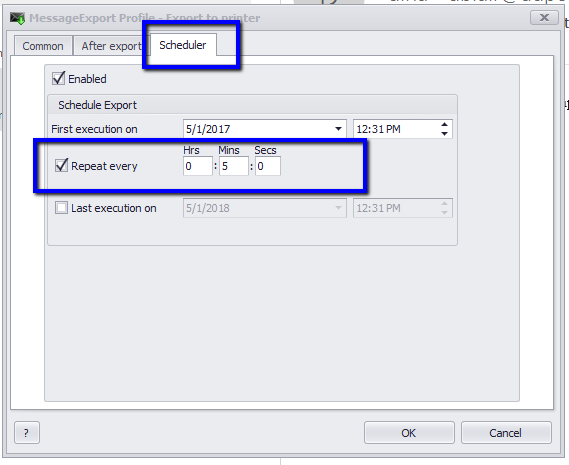 Finally, we want this export profile to run automatically every five minutes, our next step is to activate the scheduler. 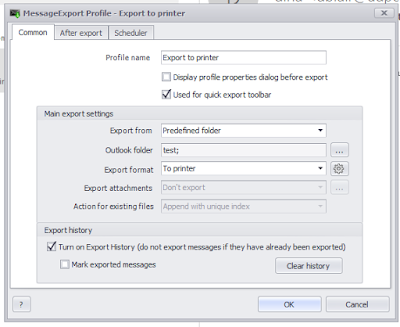 MessageExport will now run our edited "Export to Printer" profile every five minutes, and will print any new email messages it finds in the Outlook folders that you defined.. The automatic PDF conversion function will occur in the background. You may even forget that it's working!